As the celebrated landing of the Mars InSight spacecraft has come and passed, I thought it would be a good time to take a peak into our exploration of the red planet and of the planet itself. Humans have had an interesting romance with Mars for as long as we can remember. We have been flinging rovers, landers, orbiters, and flybys at Mars like a little kid tossing spitballs at their peer they like since as early as 1960 when the first mission attempt was sent to explore our terrestrial neighbor* (Mars Exploration: Historical Log). Now-a-days it is hard for us to imagine what it was like to not know what the surface of Mars looks like. At any moment if you are interested in seeing pictures from the other world, just hop onto one of NASA’s mission websites or check out one of the dozens of Twitter accounts. However, there was a time not so long ago that human’s didn’t have the privilege of knowing what the Martian surface looked like. We have only really been exploring Mars for about 54 years… and in the span of humanity that isn’t very long. Mars has been an interest of ours for a long time, ever since it was first viewed by ancient civilizations and was marked as a wanderer in our night sky. The characteristically red-hued planet is fourth from the Sun and is only about 1/2 the size of our own planet. In a lot of ways, Mars is a very harsh environment…what we would call uninhabitable. It has an average surface temperature of -81 degrees Fahrenheit with the highs and lows being -284 and 86 degrees Fahrenheit (Mars Exploration Program: Mars Facts). Those unappealing temperatures are a result of Mars’ distance from the Sun and also its thin veil of an atmosphere. Though we think of Mars as similar to Earth, its atmosphere is almost 100 times thinner than Earth’s with a composition of Carbon Dioxide (95.3 %), Nitrogen, Argon, Oxygen and Carbon Monoxide being its major components (Mars Fact Sheet). Because of this weak atmosphere, the fastest winds on Mars are only about 60 miles per hour (The Fact and Fiction of Martian Dust Storms). This is also the reason why large dust storms can form on Mars and last for long periods of time, like the one that started up this Summer. It is understandable why most people may see Mars as a more hospitable and almost welcoming planet. Since it is one of our closets neighbors, it has been deemed within our interplanetary reaches. There have been a few campaigns to get humans to Mars, and to get support they needed to make it seem feasible. So, Mars has been made in many peoples minds to seem closer, larger, similar….even familiar. But as I said earlier, in reality Mars is anything but. It is true that in the grand scheme of planetary options, Mars has its similarities to Earth. For example, it is tilted at a 25 degree angle, giving the planet seasons like we experience here on Earth. As well, we have discovered water ice at the poles and the potential for liquid water under the Martian surface. Also, the landscape, while not green with life, is still recognizable as being similar to some locations here on Earth. But even with some of these factors that could make Mars seem like a good home, there are plenty of differences that have to be considered if humans are to visit someday. Life as we know it evolved on Earth because all the parts of the equation lined up. We have evolved to the environments of Earth and though we have grown to be able to adapt our environment to suit us….on Mars we will have to bring that environmental adaption to a whole new level. As mentioned previously, the first attempt humans had at reaching Mars with a spacecraft happened in 1960 by the USSR. Though the mission was not successful, it was an important first step into our future with Mars and getting our footing as we explored other planets. Now-a-days, the planet is littered with robots, scraps, and parachute parts left over from missions. In fact, Mars is the only planet in our solar system that is inhabited solely by robots (that we know of). But despite the evidence of success these rovers and scraps suggest, getting to Mars has definitely not been easy. If you look at the list of missions sent there, out of the total 45, there are approximately 25 1/2 failures* (Mars Exploration: Historical Log). Even with the blips on the record, Mars is the planet that has also had the most successful missions, mainly because it has most missions in general. The first successful spacecraft to reach Mars was Mariner 4, which did a flyby in 1964 and was able to send 12 pictures back to Earth. After that, Mariner 6 and 7 returned even more photos from their flybys in 1969. The success of the first orbiter and lander-the Mars 3 mission was the next to come. This mission was conducted by the USSR in 1971 and was able to provide data about the planet from both the lander (approximately 20 seconds worth) and the orbiter (approximately 8 months worth)(Mars Exploration: Historical Log). These were some big first milestones for Martian exploration, but they are often not the missions most people think of. Some of the more widely recognized missions include the Viking landers/orbiters 1 and 2, Mars Pathfinder and Sojourner, Mars Exploration Rovers Spirit and Opportunity, Mars Reconnaissance Orbiter, and Mars Science Laboratory-Curiosity (Missions to Mars). It makes sense that these are better known missions since most all of them involved a rover or lander that was able to take in some data from the planet and explore its surroundings, but better yet these missions are when we started to get images back. For example, even though the Mars Reconnaissance Orbiter is not on the surface of Mars, it has been able to capture incredible pictures that have gotten people’s attention through social media and news outlets. In short, these missions have been able to bring Mars closer to people than ever before. Due to social media and the transparency of NASA, the public has been able to interact with these missions and see their progress. The Mars Reconnaisance Orbiter has a Twitter account called HiRISE where high quality images of the Martian surface are shared daily. 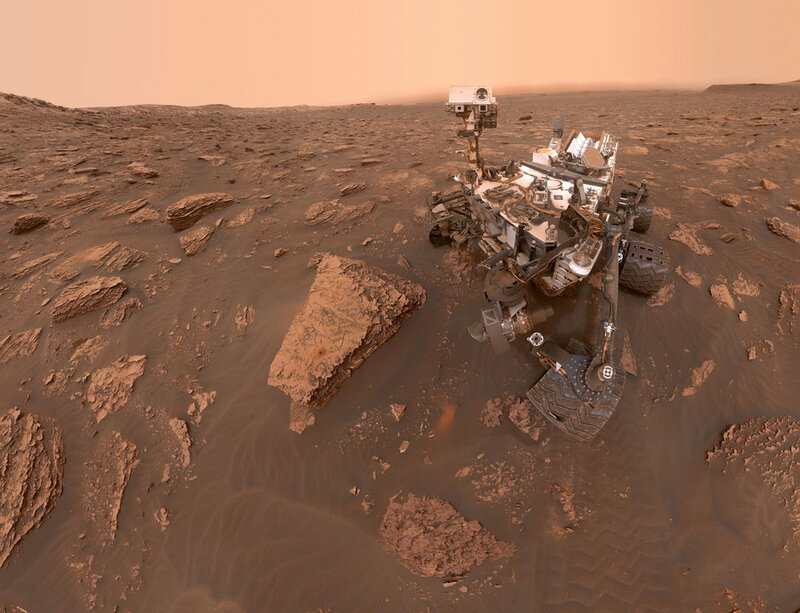 Another popular Twitter account is the one for NASA’s Curiosity rover which personifies the robot and shares its status and findings in a fun and youthful way. Many of these missions also have Instagram or Facebook pages and are available in the more traditional website page medium. Past missions have taught us a lot about Mars, but these ongoing missions continue to send us back new information as we push forward in our exploration of our solar system and its planets. As humans we are constantly driven forward by curiosity. Our need to understand and explore has pushed us to send spacecraft after spacecraft to Mars and beyond, and I don’t see that changing anytime soon. As we push to get humans to Mars, there will be much more preliminary exploration that needs to be done for us to achieve success. All the past spacecrafts and the current ones have helped us get to this point and have helped us to realize it is even possible for us to set the goal of getting to Mars. As our current rovers work hard to send us back data, the Mars 2020 mission is already in full swing. The landing site was chosen from a public presentation process where interested citizens were able to propose their favored landing sight and try to persuade the panel that they should choose that sight. though our focus is to get humans to Mars eventually, there is much more to the equation than just that. Past research as been about seeing Mars up close and understanding its environment. Those are still very much part of mission goals we see to day and for the future, but we also are desperately in search of the question if Mars harbors life or if it did at one point in its history? Also, what was Mars like in the past, is it possible that the Earth could follow a similar path that Mars did, or can it tell us anything about the make-up and evolution of our Earth? Is Mars a viable option for us to go to if our Earth is no longer a habitable place in the future? We have answered many questions from past missions, but there are still so many questions that are waiting to be answered. *Some missions are considered to be both sussesses and failures since some of the mission may have been accomplished but the whole mission was not a success. *In September 2018 a large dust storm left most of the planet covered in dust, including Opportunity. Since that storm, there has been no contact from Opportunity which may have suffered from significant power loss since its solar panels which provide most of the rovers power may not be able to collect enough sunlight.